Nucleoeléctrica Argentina S.A. (NASA in its Spanish acronym) dismissed 270 permanent workers, as a result of the austerity policies carried out by the Argentine national government. 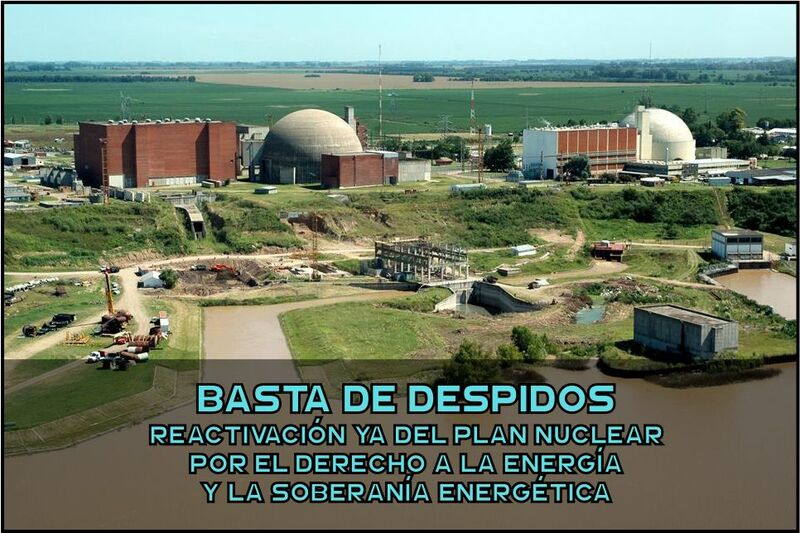 The Luz y Fuerza de Zárate trade union has been denouncing this situation for a long time as well as the attempt of flexibilization of the Collective Labor Agreement 51/05 “E” of the Nuclear Power Plants. After the persecutions, legal cases, dismissals and even attacks on the life of union leaders, the company continues to carry forward its plan of downsizing and reduction of labor rights. A few months ago, the national government had already decided to postpone the Nuclear Plan, putting at risk once again the country’s energy sovereignty. These 270 dismissals, in addition to being arbitrary, were carried out in flagrant violation of the Collective Labor Agreement, since labor stability for workers under the State’s regime has not been respected, nor were the corresponding administrative procedures observed. Given that NASA is a state-owned company, these jobs are lost due to a political decision of the national government. They express one of the toughest faces of antisocial and anti-worker policies that, in addition to not giving solutions to workers’ problems, exposes them to a state of vulnerability and total helplessness. In view of the worrying labor scenario for workers of nuclear energy facilities, we’ve decided to urgently call all workers in the nuclear area to hold an Assembly on MONDAY, JULY 30, at 1:00 pm at the facilities of the Atucha I nuclear power plant. We also call on all social and political sectors and trade union organizations of our community, to impede more progress in the destruction of our sources of work and the dismiss of so many workers who for years have been trained so that our country can be sovereign and free in the generation of nuclear energy. To read the communiqué in Spanish, click here. Tags: ATUCHAAtucha 1energy crisisFeTERALuz y Fuerza de ZárateNucleoeléctrica Argentina S.A.